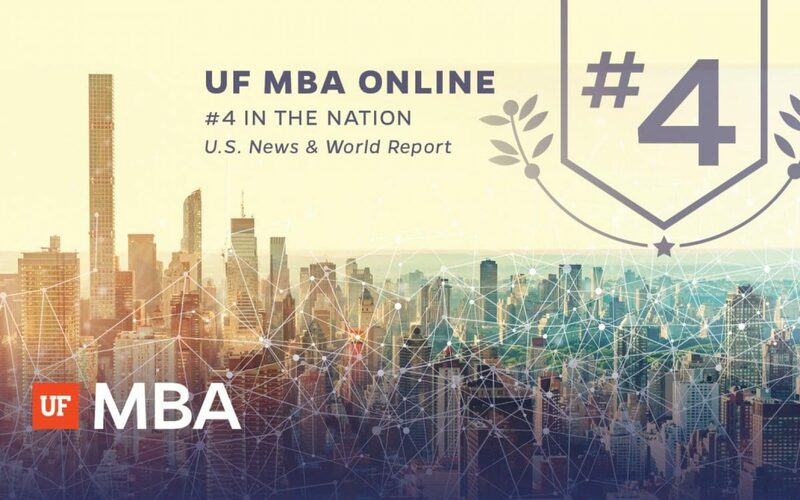 GAINESVILLE, Fla. – UF MBA at the Warrington College of Business earned its seventh consecutive top-5 ranking among publics on U.S. News & World Report’s “2019 Best Online MBA Programs” list released January 15. With a score of 95 out of 100, it is ranked the No. 4 program in the nation and the No. 3 program among U.S. publics. To create its annual Best Online MBA Programs rankings, U.S. News sent surveys to the 299 schools that offer online MBAs. The rankings were based on five weighted categories: Engagement (28 percent), Student Excellence (25 percent), Expert Opinion (25 percent), Faculty Credentials and Training (11 percent), and Student Services and Technology (11 percent). UF MBA scored 80 points (out of 100) or more in three of the four points-based categories including 90 points in Student Excellence and 87 points in both Engagement and Faculty Credentials and Training. Expert Opinion is determined based on a 1-5 scale, in which UF MBA ranked No. 4 overall and No. 3 among publics with a score of 3.8. In the Student Excellence category, which measures GMAT and GRE scores, work experience, undergraduate GPA and the school’s overall acceptance rate, UF MBA was ranked in the top 10 overall for a fourth year in a row. In keeping with its innovative roots, UF MBA also recently established a fully online program that allows students to pursue their MBA at a top ten university from anywhere in the world. The fully online program spans 24 months and does not require a single visit to campus. In addition, UF MBA offers 16-month and 27-month hybrid programs that require occasional campus visits. Learn more about UF MBA’s online programs by requesting information here.